The most luxurious Atlanta condos we offer are in midtown Atlanta, with incredible views of the Atlanta skyline! If you are considering leasing a condo, nothing is more important than Results. We will guide you through every step of the way. We invite you to Request your complimentary list of available condos. The Atlanta area is HOT for lofts, and they don't last on the market long. 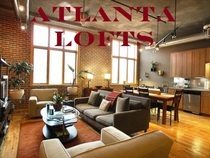 If you are considering leasing an Atlanta Loft, we will guide you every step of the way. Most properly priced properties are on the market for only a short time, so don't delay.